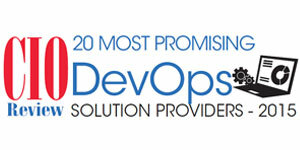 NEWTOWN, PA - June 26, 2015 - CIOReview Magazine has selected ObjectFrontier Software, Inc. (OFS) as one of 2015's Top 20 Most Promising Providers of DevOps Solutions in the US for its efforts in automating the software development and deployment life-cycle for its customers. CIOReview compiles the annual listing of 20 companies to highlight those at the forefront of providing DevOps solutions and impacting the marketplace. The great convergence of interest in DevOps that is sweeping the IT arena this year adds extra weight to this distinction. OFS is experiencing this growing interest, as it helps more corporate IT and Independent Software Vendor (ISV) clients build better ways to accelerate the provisioning and promotion of all the components of a new system. This includes operating systems, executables, scripts, databases, graphics, etc. going through all of the various development staging areas and then into production. As a forward-thinking software engineering firm, OFS decided to invest in DevOps several years ago, seeing it as a way to bring speed to the production side of software, just as Agile methods do for the development side. This allows OFS to deliver software systems more quickly all-around, and thereby help firms compete better. OFS is leveraging this knowledge, along with its expertise from two decades in software product engineering, to help automate the provisioning, configuration, build, test, deployment and monitoring of software systems with the best DevOps tools available. "We offer services to help companies make the transition to a streamlined DevOps model. It eliminates the bottleneck that often occurs when code, which was developed and tested quickly to meet a market need using Agile methodologies, cannot be moved as quickly into production because of various roadblocks," says Rich Napoli, CEO of OFS. Right from provisioning the first development environment, using various open-source build tools, OFS helps companies quickly automate the continuous build and integration of the software. The handholding approach continues to the automation of unit and acceptance testing and onward to initial production deployment. This helps customers streamline and integrate their deployment and operations processes, enabling shorter time-to-market. And combining this new approach with OFS's long-standing agile development methods accelerates the delivery of production-ready software even more. These rapid software development and deployment techniques and tools are critical to businesses looking to digitally transform themselves and compete in this modern age. ObjectFrontier works to continually bring new innovations to its customers by examining and assessing upcoming technologies to position them on the frontier of new thinking. This allows OFS to build engaging, intuitive, and responsive mobile and cloud apps that drive clients' revenues. Their investment in DevOps technology is quickly proving worthwhile for customers. Napoli says, "The end goal is to help our customers swiftly build and deploy digital products that transform their business and beat their competition. We will continue to support them through our expertise in the latest DevOps tools such as Puppet, Chef and Docker in order to help automate their full lifecycle of software development and deployment." About OFS: OFS helps clients build innovative software products that drive revenue for their business. OFS uses the latest in social, mobile, cloud and data analytics technologies to build software that is compelling, packed with innovative features, and designed for rapid evolution to propel customers past their competition. Founded in 1997, OFS has a deep heritage of building commercial products for software vendors, which has given them the insight and experience to create impactful software for any business. OFS has over 500 employees spread across its US offices in Atlanta, New Jersey, Philadelphia, Boston, Washington DC, and its offshore facility in Chennai, India. For more information, please visit www.objectfrontier.com/. About CIOReview: CIOReview is a technology magazine that talks about the enterprise solutions that can redefine the business goals of enterprises tomorrow. It is the leading source that shares innovative enterprise solutions developed by established solutions providers, upcoming hot enterprises and is a neutral source for technology decision makers. Published from Fremont, California, CIOReview is an excellent platform for the enterprise to showcase their innovative solutions. While U.S. enterprise market is growing exponentially, there is a vacuum among entrepreneurs of enterprise startups. We believe that there is no other platform which gives companies a heads up on the innovative solutions that the startups are working on, what are the needs that haven't been met yet and more. CIOReview will act as a platform allowing high level executives in the enterprises to share their insights, which in turn will help the enterprise startup ecosystem, help technology and business leaders with analysis on information technology trends and give a better understanding of the role that enterprise solutions play in achieving the business goals. For more information, please visit http://www.cioreview.com/.